FEARING FOR THEIR LIFE after being released from prison on May 15 1955, Fidel Castro and his younger brother Raul went to Mexico City to organize the war against dictator Fulgencio Batista. "We will return when we can bring to our people the liberty and the right to live decently without despotism and without hunger," wrote Castro in the weekly Bohemia. "Seventeen months were to pass from the time Castro left Havana until his disastrous and fateful return to Cuba," says New York Times journalist Herbert L. Matthews in his book Revolution in Cuba. "It was a frustrating, harassed, penurious time. The two great problems were to train his expeditionary force and raise the money for arms and a boat on which to get to Cuba. These had to be done in the face of constant interference by the Mexican police, treachery among the Cubans, and spying by Batista agents. At one time Castro and twenty-two of his comrades spent three weeks in a Mexico City jail for illegally possessing arms." Shortly after arriving in Mexico, the Castros were introduced to a young Argentine physician named Ernesto Guevara. "I had been linked to him from the outset by a tie of romantic adventurous sympathy," writes Guevara in Reminiscences of the Cuban Revolutionary War, "and by the conviction that it would be worth dying on a foreign beach for such a pure ideal." Guevara joined the expedition as the revolutionary army's official doctor. A leisure yacht named Granma was secured for the trip to Cuba. Although seaworthy, the ship was not in the best shape. Badly worn gears prevented the ship from achieving significant speed, and the radio could only receive, making it impossible to communicate with allies in Cuba. The craft was overcrowded with weapons, ammunition, and 82 soldiers. To make matters worse, the ship's tanks held 1,200 gallons of fuel, not nearly enough to reach Cuba, so an additional 2,000 gallons, in cans, were stored on deck. "It was 1:00 a.m., November 25 1956, and time to leave," recalls Faustino Pérez in Diary of the Cuban Revolution. "As quietly as possible, with only one engine going at low speed and all her lights out, the Granma began to pull away. We were crouched so close together that we were almost on top of one another. The helmsman followed the middle of the channel toward the river's mouth. On either side of us, the city slept on. It took half an hour to leave the river, and perhaps another half an hour to cross the harbor. No one had seen us, and were now entering the gulf." "The departure was hasty," writes Matthews in The Cuban Story, "for the Mexican authorities were after him. There was little food; the boat--which could comfortably accommodate no more than a dozen men-was dreadfully overcrowded; the Granma's engines were bad. Everything seemed to go wrong. It had been arranged that his 26th of July followers in Santiago de Cuba would rise on November 30, the day Fidel and his band were supposed to land. There was a brave, but of course, futile uprising on November 30, with Fidel far out to sea." On the last day of the journey, ex-navy lieutenant Roque fell overboard. "The Granma's search lights were turned on for the first time," recalls Faustino Pérez in Diary of the Cuban Revolution, "when it was more dangerous than ever. Nothing helped. Our comrade was being swallowed by the deep. Never willing to give up, Fidel ordered one more search. We heard the cry "Here!" again, weaker but inexplicably closer now. Pichirilo Mejías, our brave, efficient Dominican helmsman, saw him first and miraculously rescued him. His strength, his ability, his level headedness, as well as Fidel's faith and the efforts of his comrades had saved his life." The landing of the Granma, in December 1956, was planned to re-enact the route that José Martí had followed to begin Cuba's War of Independence in 1895. The target landing spot was a town called Niquero, in Oriente province. Still waiting for them on December 2 was Celia Sánches, one of the founders of the July-26-Movement, with an assortment of trucks, jeeps, food, weapons and about 50 men. Leaking and running days behind schedule, the Granma was spotted by a helicopter, and the rebels were forced to beach the ship at a spot called Playa de los Colorados, near the village of "Las Coloradas," about fifteen miles south of the designated spot. The new landing area was more of a swamp than a beach, and the rebels were unable to unload most of their weapons due to the muddy waters, the thick undergrowth plant life and small crabs. "Just consider where the landing took place," says Celia Sánchez in The Twelve, a book by Carlos Franqui about the early days of the struggle against Batista. "If they had debarked right on the beach instead of at the swamp, they would have found trucks, jeeps, gasoline. It would have been a walkaway." The troops regrouped inland and began to move toward the Sierra Maestra, unable to find anything to eat that first day. Along the way, peasants and farmers gave them food and water, until on December 5, betrayed by their guide, the rebels were ambushed at Alegría de Pío. They were forced to scatter again, and most were killed in battle, or as they attempted to surrender. 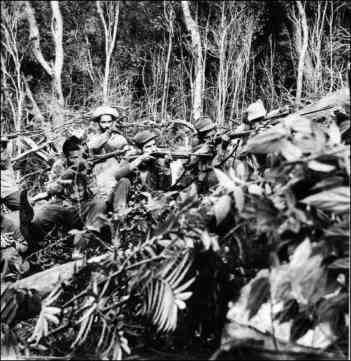 For eleven days the remaining rebels, wounded, hungry and scattered, evaded Batista's army, regrouping on December 18 deep inside the Sierra Maestra Mountains. Of the 82 who made the trip from Mexico, only twelve made it to the Sierra Maestra, including the Castro brothers, Che Guevara (wounded and bleeding), Camilo Cienfuegos, Juan Almeida, Efigenio Amejeiras, Ciro Redondo, Julio Díaz, Calixto García, Luis Crespo, Jose Ponce and Universo Sanchez. "We will win this war," said Castro, "we're just beginning to fight!"